← Pussycat, pussycat, where are you? Last time I visited Kentucky in a February (2012) I was hoping to see some snow, but was unlucky as it was cold but completely snow-free and even warmed-up considerably before I left for home at the end of the month. This time, I kept my eye on the weather forecast and just before I left England on 14th February, noticed that there was a chance of snow flurries the following Tuesday/Wednesday so at the last minute I packed my Norwegian Bergan and my Snow Boots. Thank goodness I did as little did I know that Storm Octavia was to hit Kentucky with full force shortly after I arrived. 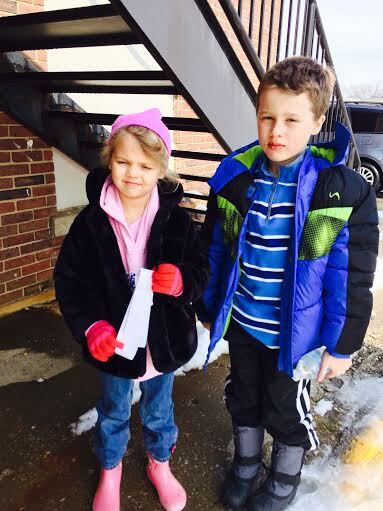 My son, his wife and family live in Lexington, Kentucky and I was going to visit them not so much for a holiday, but to help my daughter-in-law as she was having surgery and would be out of action for a while and with three children aged nine, six and three, someone needed to be there to help out. Normally I travel to the USA and pay a bit extra to get premium seats with a little more leg-room for that long hop over the big pond, but I was pleasantly surprised when my lovely son insisted he upgrade me to First Class (or Business Elite as Delta call it). WOW what a way to travel and it has now ruined me for all future flights. I am really going to have to bore you all with my fantastic experience which started the moment I arrived at Heathrow – thankfully only twenty to twenty-five minutes from home. I admit I did dress for the trip and was immediately complimented by the Delta ambassador waiting at the front of the Business Elite channel. Ok, ok – so that’s what they’re supposed to do, but it is nice to be noticed! My son had assured me that all I needed was my passport (no tickets or boarding cards) and he was right. I was the only person in the queue – actually there was NO queue! – and waved goodbye to my husband before I was ushered to baggage control. My cases (I was allowed TWO and both could weigh up to 70lb) were taken from me and I was escorted to the special security where I was quickly dealt with and taken through. After stopping at Duty Free (I really had to stock up on my one and only favourite perfume) I found my way into the Sky Lounge which was almost empty and thoroughly enjoyed the next couple of hours with free coffee, drinks, breakfast, fruit, snacks etc. watching the flights take off and land, and also keeping a look-out for famous faces! Another luxury of Business Elite is being boarded first and I was escorted to my seat and immediately offered a glass of champagne, orange juice or whatever drink I wanted – in a real glass flute; not those awful plastic thingies that I always manage to either crack or bend and spill. Each seat is a ‘pod’ so you are completely isolated with tables to one side and your seat can go in absolutely any position – even a flat bed – without disturbing whoever is behind you. To be honest, you are so isolated in the seat that you do not know if there is anyone in front or behind. There is even a button which makes the chair turn into a massager which pummels your back slowly up and down – absolutely fantastic. Pillows, blankets, sleep masks, handcream, face moisturiser, ear plugs, wipes (you actually don’t need these as they bring around hot flannels frequently), Bose earphones, charger for iPad and/or phone, flight socks, pens, paper, toothbrush and paste etc. The list goes on and on. I’ve got to do this again…. We took off on time and as soon as we were up I received a lovely tray with a plate of smoked salmon and capers (more drinks on offer but I stuck to water). Time to choose from the menu and with five courses, limitless drinks and coffee I knew I wouldn’t go hungry. And that was just during the first half of the flight. More was to be served nearer landing! I won’t go into detail but suffice to say the food was superb and designed by a top class chef – all with silver service. A far cry from the plastic tray of food I usually don’t eat in Economy. I managed to drink six bottles of water on my flight which kept me well and truly hydrated. I couldn’t sleep even though I tried with the flat bed – the problem of traveling during the day – but I did watch a really thought-provoking film called Rudderless and also caught up on some episodes of a TV series I was watching on my iPad. 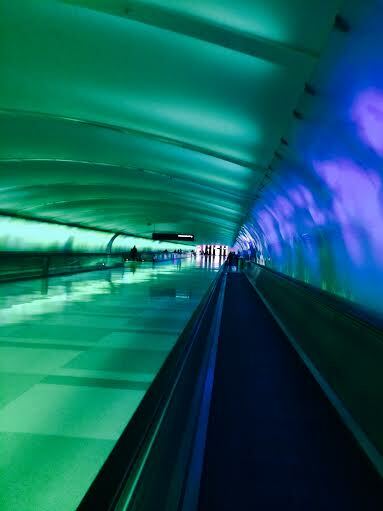 We landed at Detroit which I know fairly well and off I trotted to security and entrance to the great USA. As I have had an ESTA before and have used it, I could go via the automatic machines and input my passport and have my fingerprints scanned on the front panel; that is if you don’t have long fingernails like I have !! After several attempts of getting my four fingers on the screen all at once, a very pleasant security person came over to help and between us, we managed to hold my fingers down so the nails did not lift them off the panel (real nails I might add, not falsies). Through customs quite quickly; cases retrieved from special carousel (Business Elite) which were straight away whisked away for the next flight, then into the Sky lounge for a quick sit down and drink. I had a fairly long lay-over at Detroit so I made full use of the lounges in both the arrivals terminal and the departure terminal; they even included log-fires (probably imitation ones) set into the walls with settees and armchairs set around them and they were extremely effective and warming. Although I had eaten well on the plane I really enjoyed the salads, nuts and olives available in the lounge. Oh – and of course the Popcorn – we were in America !! 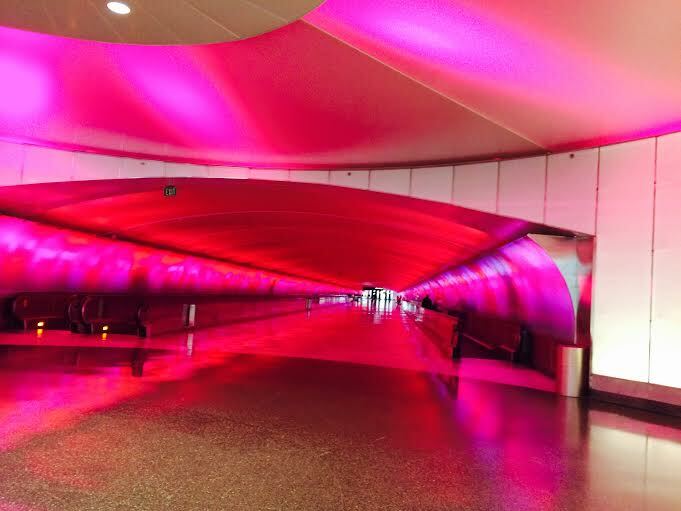 Detroit has a wonderful glass tunnel which changes colour every few minutes and I really enjoyed strolling through it to the departure terminal. As you can see, not busy at all. I really should have noticed the alarm bells ringing in my head when we also had a delay at the boarding gate for the Shuttle flight to Lexington. A lot of flights were being cancelled due to the cold/snow but eventually we left after nearly an hour of being de-iced on the runway, and I arrived tired but happy in Lexington where my son was waiting to greet me. I was determined to find at least one Geocache whilst in Kentucky and had warned my son that this was my intention and to also introduce my grand-kids to my new hobby. 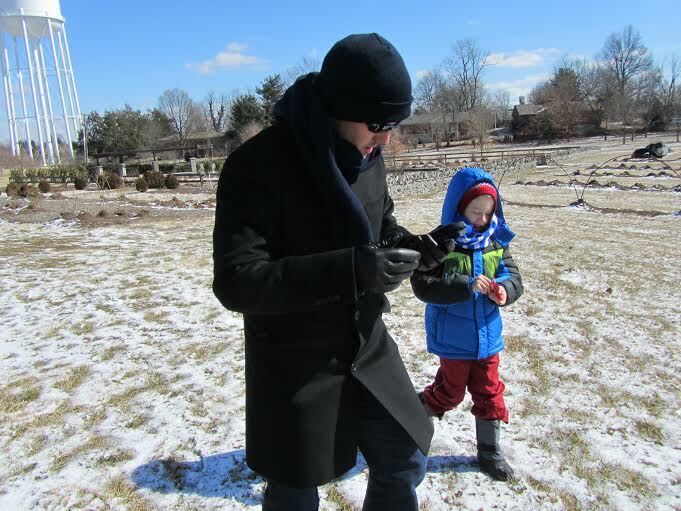 Bless him, he had no real interest in it but on Sunday morning informed me that as it was cold (-12°C with a windchill of -17°C) but sunny, he would drive me and my grandson to the nearby Arboretum where there were three caches. It was a bit too cold for the girls to go. My grandson had already picked the name Strong-Robbinn because he thought it was extremely strong and brave to face the elements! – so off we went and boy, was it cold! Daddy-Robbinn (sorry James) even downloaded the Geocaching app on to his phone so that I didn’t need to worry about using my data and creating huge bills and I had also turned off my roaming and cellular data to avoid charges whilst in the USA. I’ve read too many horror stories about this. There had been a little snow in Lexington and I was concerned that we might not find the caches but soon we were heading in the right direction to GC4NT42 BGC Cache To Eagle Series #12-E/P Dist V2 and Strong-Robbinn was leading the way with his dad’s iPhone although I did notice that Daddy-Robbinn was sometimes in charge of the compass! We found a series of little hedges at Ground Zero and carefully began searching until I eventually found the little clip-box. Strong-Robbinn was delighted, as was I. Not too sure about Daddy-Robbinn who looked quite cold. The funniest thing was when Daddy-Robbinn found some sunglasses laying on the ground – not realizing they had slipped off his own nose!! Probably too cold to feel them going. We decided to try for the next cache and were soon working our way across to GC2QE9Q UK Arboretum Eagle Projects – display and screen; the clue being ‘this place needs some sprucing up’. I was grateful for the clue as it really was cold; in front of us was a huge spruce tree and hanging in its branches was just what I wanted to see – a camouflaged container. 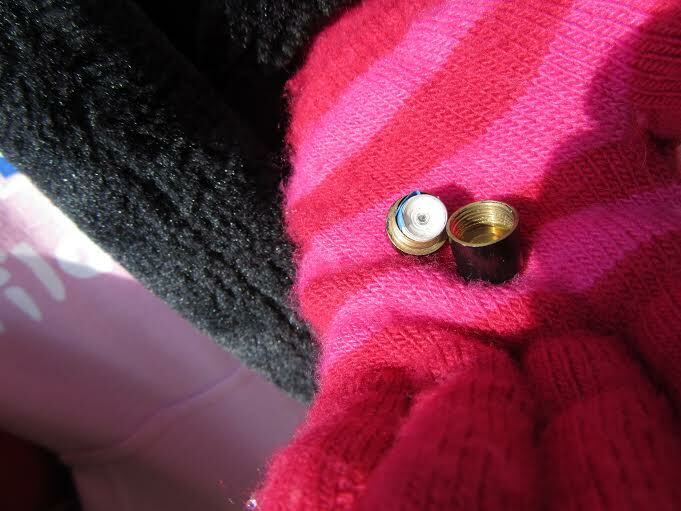 On my first full day in Kentucky I was so excited to have found two caches. Even if I didn’t have time to find any more, I would be very happy as I knew that I could bring my Surrey Travel bug here and leave in this large container if I found no more caches suitable for leaving a bug. Container in a Spruce Tree !! 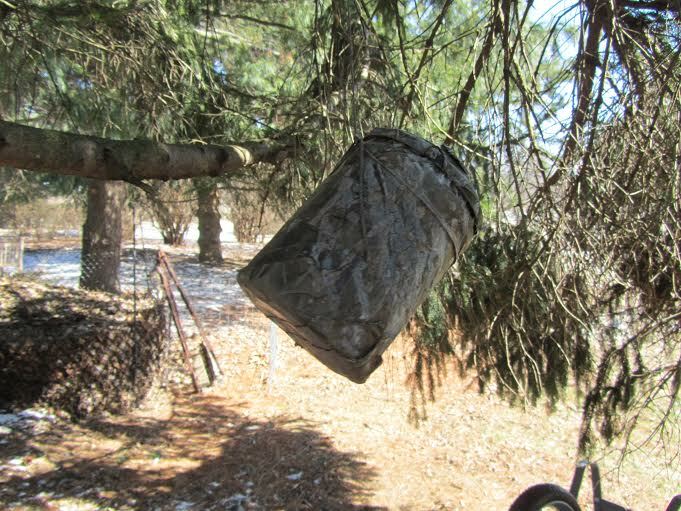 Looking at this photo of the camouflaged container hanging in the tree, it almost looks like a sunny beach somewhere but believe me when I say it was cold enough to freeze the balls off a brass monkey !! 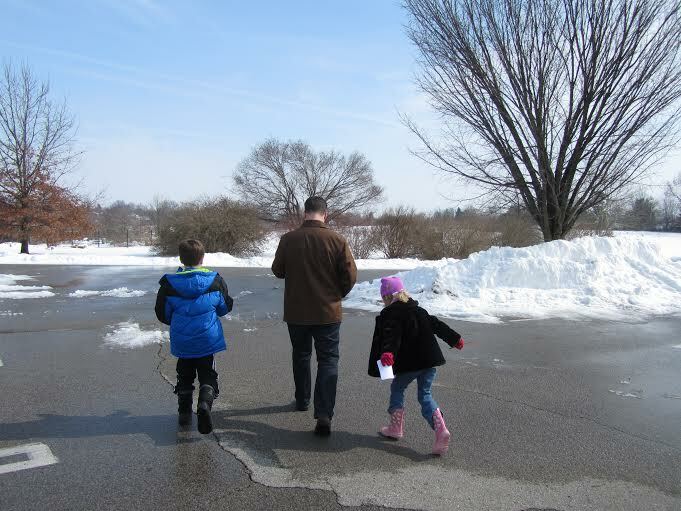 All three of us headed back to the car and decided it really was too cold to attempt the third cache. I woke up Monday morning to find Storm Octavia had arrived and over the next days, we were to find that Kentucky was to suffer the coldest, snowiest spell in its recent history. Being the mad Englishwoman that I am, I wrapped up warmly and ventured outside for some photographs – I love snow and can’t resist going out in it as long as I am wrapped up well and I had remembered to pack my Bergan and Snow Boots thankfully. 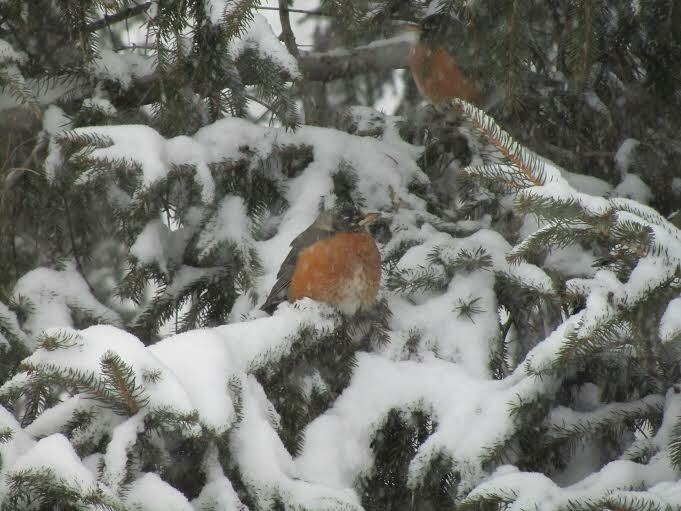 I was met by an amazing sight of hundreds of American Robins vainly attempting to avoid the snow and cold by snuggling under the trees in my son’s garden. 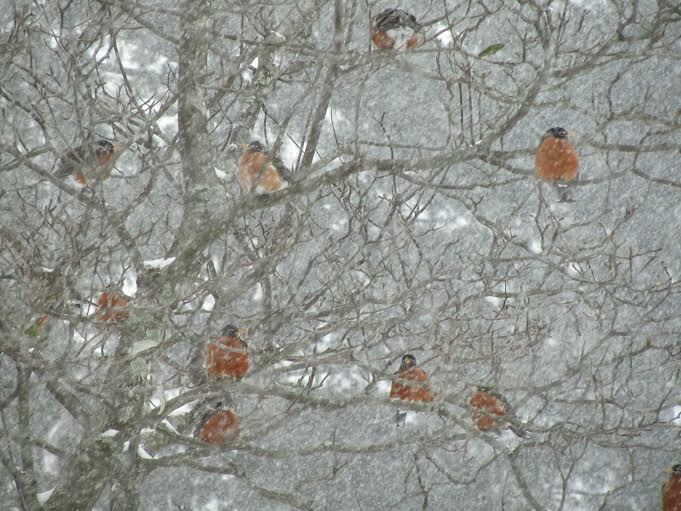 They were also crowding around the air-vents of the house to keep warm. Unlike our British Robins who are usually seen in pairs (and usually only one pair to a garden), American Robins are in flocks and quite a sight to see. The next thing to see was me stealing bread and throwing it out for the poor little things !! I do wonder how many of the birds survived the storm which was pretty bad. I have a very strong love of all birds especially Robins so I must tell you a little story…..
My surname is Robb (I am married to a very Scottish Robb of the MacFarlane clan). We moved to Camberley in 2002 and I started up a little business which grew quite considerably. Not knowing what to call this business, a good friend made the joking comment that a hanging-basket stand I had in the front garden looked just like a pub sign so why not call myself ‘Robb-Inn’ which is what I did and I had a little Robin designed to use as my logo. I enjoyed running my business but over the past four years I have been slowly running it down and exactly a year ago, closed it finally and ‘retired’ but I retained the name Robb-Inn to use as and when I need to. 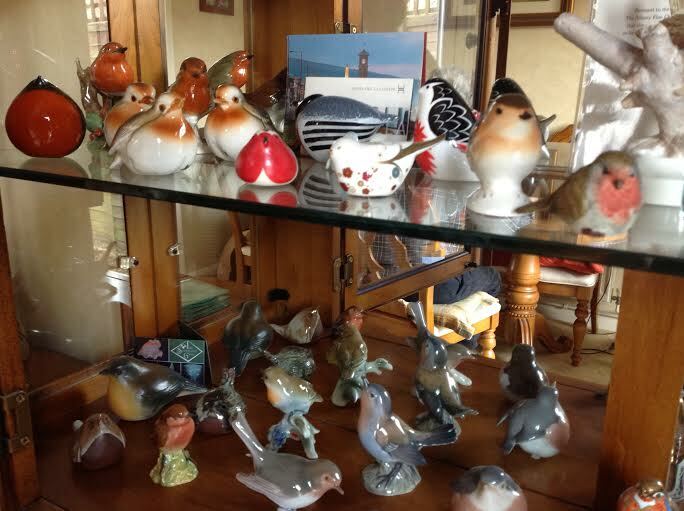 I also have a wonderful collection of ‘Robins’ in china and porcelain which I have collected over the years. But, back to Geocaching. 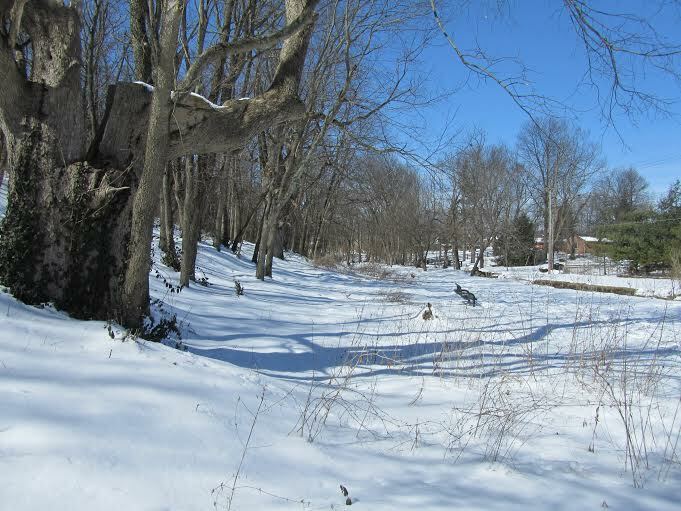 The following week saw Kentucky get deeper and deeper in snow – I believe it was the worst for seventy years and the temperatures dropped and dropped. I think the coldest was -22° with a RealFeel (American for windchill) of -35°. Even though it was really cold, it was picture-postcard pretty as when it wasn’t snowing, the skies were the deepest blue and I went out walking, slipping and sliding almost every day. 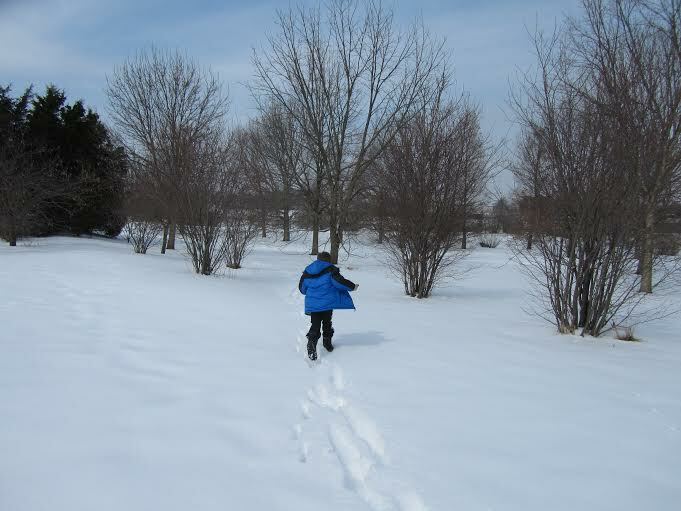 How I wished I had snow shoes – the ones that look like old-fashioned tennis racquets – it would have made walking so much easier as the snow was knee-deep in places. 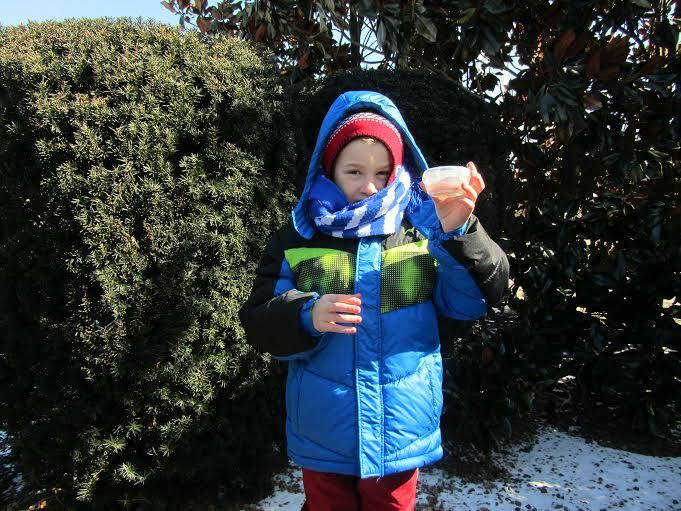 It was powder snow and useless for snowballs (probably a good thing!) and also hopeless for making snowmen as it just didn’t hold together. It wasn’t even wet snow. 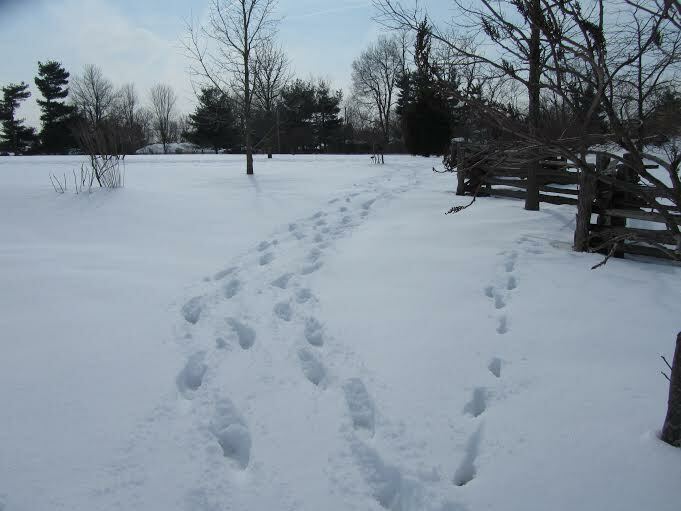 In England, a few flakes of snow and everything stops dead but out in Kentucky everyone just jogs along. The schools had to remain closed as the school buses couldn’t run on the side roads but snow-ploughs were out and the main roads were kept extremely clear. 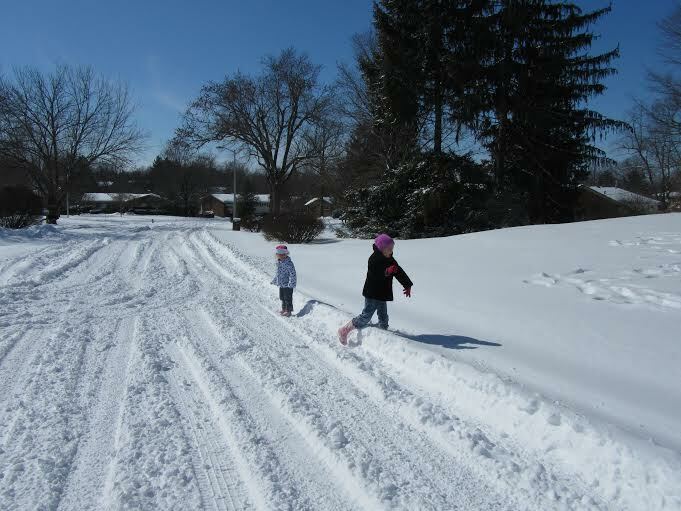 Most of the Kentuckians kept their driveways clear and were seen shoveling snow every day and I also learned that if you have a path (or sidewalk) in front of your property, you had to keep that clear as well. 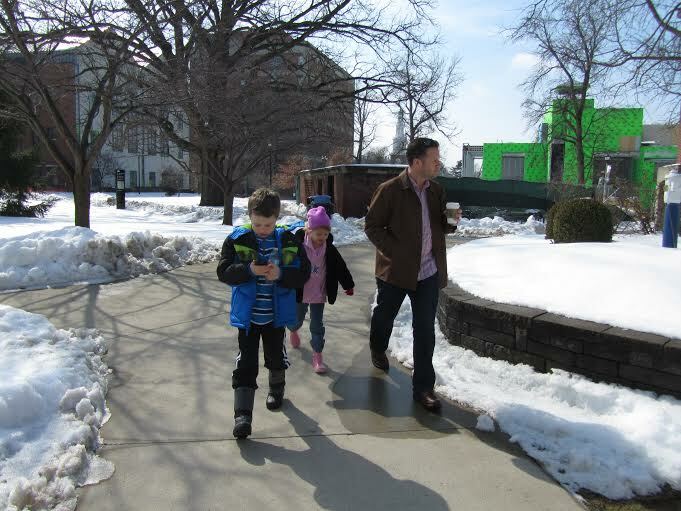 The following weekend my son offered to take me to the University Campus (strangely enough it is called UK – University of Kentucky) as there are quite a few caches hidden there. This time my six-year-old grand-daughter joined us deciding she wanted to be called Little RobbInn. The first one we attempted was GC1KQMW Smokey Bear’s Hangout which, as you can probably guess, was where the smoker’s hang out around the University Hospital. Luckily I spotted the film canister quite quickly, velcro’d underneath the metal staircase and the grand-kids were delighted to share in the ‘find’. 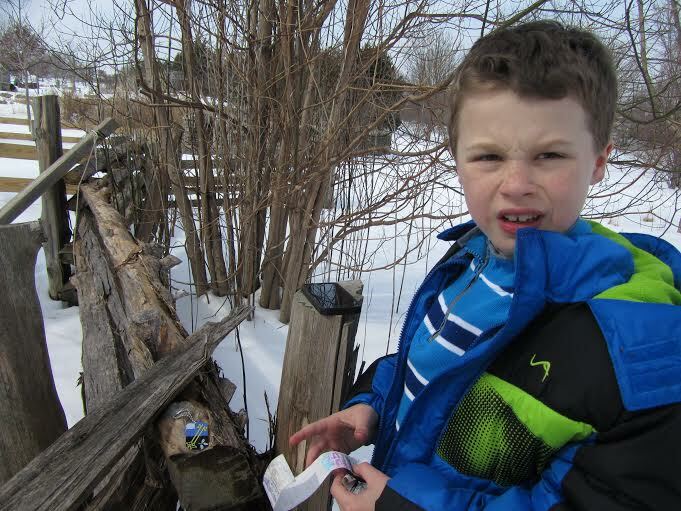 There wasn’t too much snow here and the cache was well-above the ground so a nice easy find. Not so the next few we looked at which we didn’t even try and find as the snow was just too deep. My son very kindly drove from place to place trying to find a cache worth searching for. Our next try was GC1Y1VX Someone’s Watching and this was among the University buildings and the paths had been cleared – hurray! Strong-Robbinn was getting very good at following the compass and we were soon on our way to GZ. As soon as I saw the statue of James Kennedy Patterson I guessed that this was the ‘someone’ and there were four metal benches facing him. I explained to the grand-kids that this was a very tiny magnetic cache probably hidden on one of the benches and off they went searching. The snow was very deep around the seats but Little-Robbinn soon spotted the container underneath one of the benches. Well done Little-Robbinn. They were intrigued at the tiny log which was perfectly dry and rolled up tightly, and very keen to try and find another cache. Unfortunately, we couldn’t find a suitable cache nearby so soon started to head home. On the way back Daddy-Robbinn spotted a possibility just off the main road so we parked up and headed towards what appeared to be a tiny graveyard surrounded by a dry stone wall. We stumbled around in knee-high snow for ages but had no luck as it was just too deep to find anything at ground level. Daddy-Robbinn then promised to take us back to the Arboretum where there was the chance of finding the third cache which I didn’t try and find on Day 1 but if not, I could quickly go to the one hanging in the tree and deposit my Surrey travel bug. 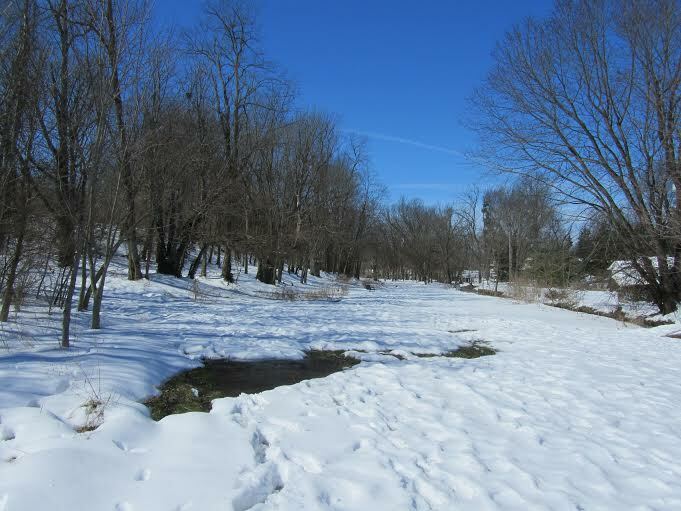 The Arboretum was beautiful in the snow with a bright blue sky and skiers in the distance. I quickly found the co-ordinates of GC2RXX UK Arboretum Eagle Project – Split Rail Fence in the phone and off we went. We soon came to virgin snow which got deeper and deeper. Daddy-Robbinn was not wearing boots so decided to stay near the car and it was obvious that Little-Robbinn was just not tall enough to wade through so Strong-Robbinn and I ploughed on. We eventually came to a split rail fence which we followed round until Strong-Robbinn spotted the film canister hanging from one of the rails (thank goodness it wasn’t at ground level). I was extremely pleased to realize that I could leave my travel bug here as it fitted (just) into the canister along with some cents which someone else had left. Strong-Robbinn and I happily carried on around the split-rail fence to eventually find the carpark where Daddy-Robbinn and Little-Robbinn were stomping up and down to keep warm. I was leaving Lexington on Wednesday at lunchtime but on the Tuesday I had the chance for a longer walk than usual, and on my own. There was a cache hidden not too far from the house which I had briefly looked at when passing some days earlier but with all the snow it appeared to be on private land. I decided to have another look as the clue ‘Silver Bison’ was not a tree as I had first thought, but a coin and also there was a little stream running between two houses and the cache was possibly hidden at the bottom of one of the posts near the stream although I didn’t understand the clue. Unfortunately there was no way I could get near the water as the slope was extremely slippery and I could see myself sliding straight into the stream and it was still -6°C so this one had to be a DNF. As I headed back to the house after visiting a coffee and donut shop, I passed Stonewall Park and knew there was a cache hidden there. It was one of those stunningly glorious days with a brilliant blue sky, very cold but magical. I decided to have a go at finding the cache although it was off the main pathways and in deep snow. 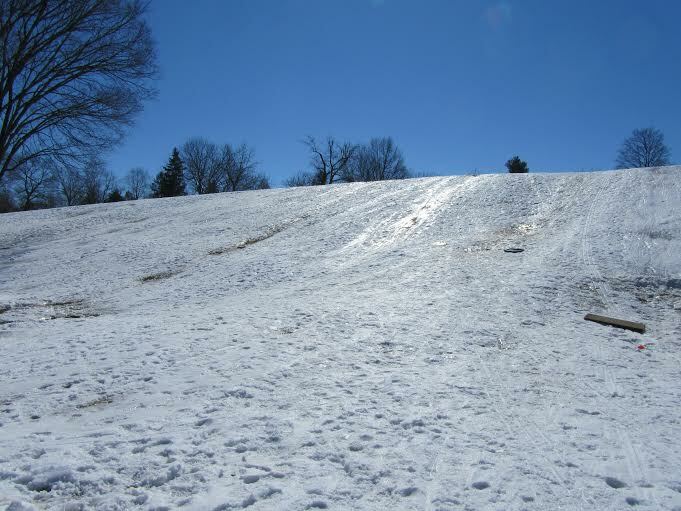 The first obstacle was crossing the solid ice formed by the kids (young and old alike) on a hill which had been used for tobogganing; it was absolutely lethal and I nearly turned back as I didn’t want to end up on my bum bruised and sore, or worse, have a broken ankle just as I was going to fly home. I managed to get across the bottom of the slope and the next obstacle were hidden pools of freezing water; I’ll never know how they stayed unfrozen in the temperatures we were having. This is where I really needed the old-fashioned tennis racquet snow shoes! The snow was frozen and for a few steps I could walk across the top then suddenly my feet sank into the snow. I was carrying a paper bag of donuts and once, when I turned around, I saw a donut laying in the snow !!!! 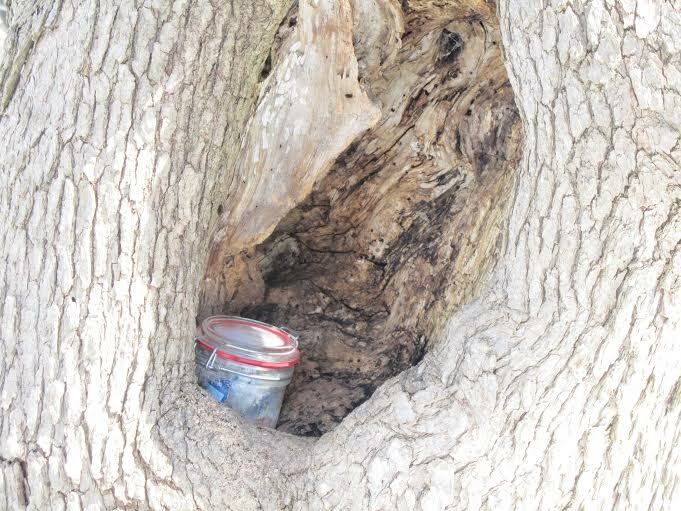 Eventually I heard that magical tune on my phone so I knew GC53A3V Old Jar in a Tree was within reach. I spotted the tree as it was huge and I laughingly climbed around it, laughing because the donuts kept falling out of the bag. 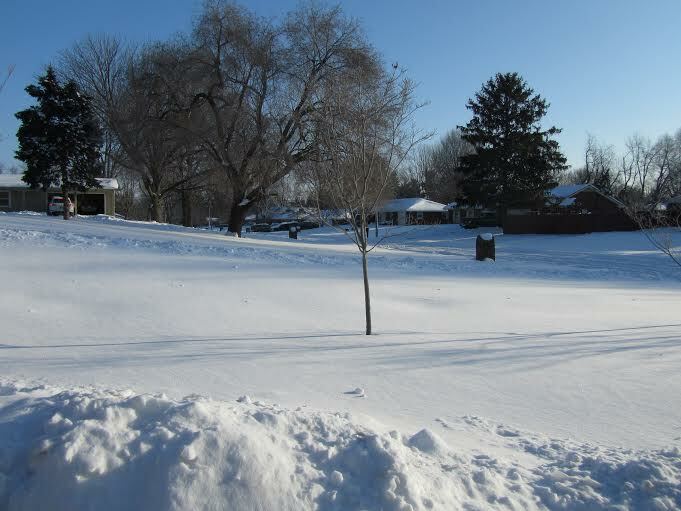 At least it was clean virgin snow – no yellow patches….. I started to get a bit concerned when I couldn’t find the cache and worried that it was too hidden by snow but whilst reaching for a donut yet again I looked up and there it was – nestling in a hole in the trunk. A lovely little Kilner jar (I think the Americans call them Mason jars) keeping the log and contents perfectly dry. A perfect find to end my Kentucky trip. It was a whole different story trying to get out of Lexington the next day but that is a different matter. Suffice to say I managed to arrive home safe and sound although my luggage took an extra day. I cannot fault Delta Airlines for their help and care getting me to Atlanta and then rebooking me for the flight to Heathrow. Atlanta had all but closed down due to the weather and I was very very lucky to get home only an hour later than originally planned. Unfortunately I missed my connection in Atlanta even though an extremely pleasant co-pilot escorted me from the Shuttle all the way to the departure terminal and my boarding gate but it had shut one minute before I arrived there. However, I was booked on to another plane leaving only an hour and a half later and was well-looked after in the Sky Lounge and on the plane, where I slept for most of the journey home. It wasn’t until I arrived home and was glancing through my bits and pieces on Geocaching.com that I realized that I had been given a Kentucky souvenir – my fourth souvenir to date. Designed by Steven R., a Groundspeak lackey with a fondness for giant robots, comics, and animation, he can be found in front of a computer or drawing table, designing awesome Souvenirs and graphics for Groundspeak’s mobile team. 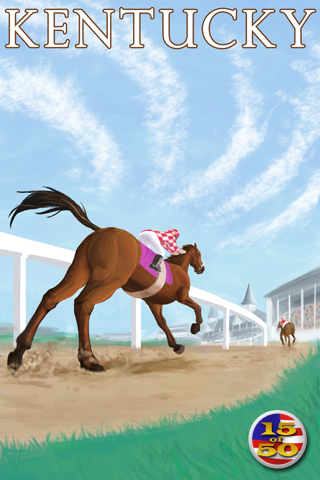 The Commonwealth of Kentucky is famous for breeding and racing thoroughbred horses and for its production of bourbon, tobacco and cars. The “Bluegrass State” is also famous for bluegrass music. A lovely end to my Kentucky trip. This entry was posted in Geocaching, Hobby, Kentucky, Snow, Storm Octavia, Travel Bugs and tagged Cache, Geocaching, Hobby, Kentucky, Log Book, Snow, Storm Octavia, Travel Bug. Bookmark the permalink. 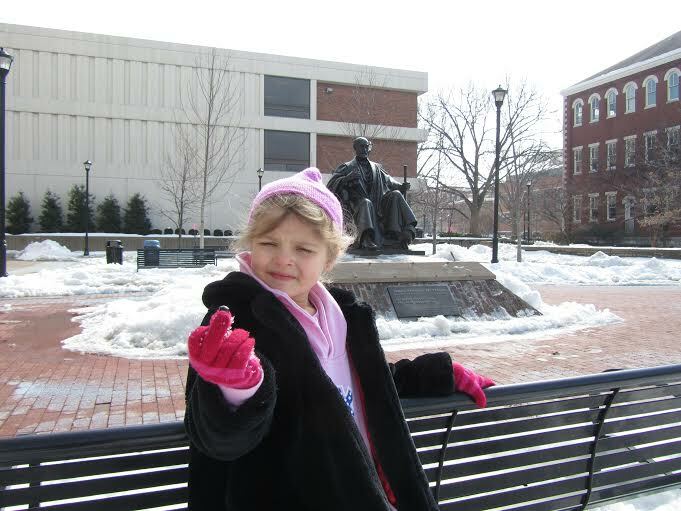 2 Responses to Let it snow, let it snow, let it snow…………….. Thanks WK. I was extremely lucky to be treated to First Class and so pleased that I managed to find six caches in the USA. But for the storm I would have found a few more although I wouldn’t have wished to have missed the ‘dare I say’ excitement of Octavia. It really was an experience.